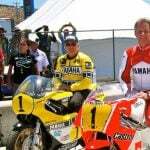 A special one-off Yamaha R1 that “King” Kenny Roberts will ride at Laguna Seca at this year’s U.S. Grand Prix will be auctioned off to benefit an arts school in New York. The GYTR-equipped R1 with Yamaha’s 50th anniversary red and white paint scheme will be sold at Mecum’s Motorcycle Auction, Aug. 18, in Monterey Calif. by special guest auctioneers Roberts and television personality Jay Leno. Proceeds from the auction will benefit Bailey’s Café, a school for the arts in the Bronx. 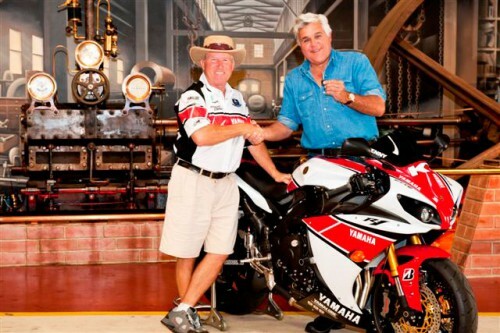 Leno is a strong supporter of Bailey’s Café, helping to raise $120,000 for the school in 2009 by auctioning his own personal customized Yamaha V-Max. 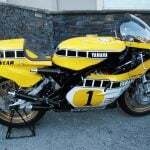 Cypress, California — July 19, 2011 — Yamaha Motor Corp., U.S.A., is very pleased to announce a special opportunity for motorcycle enthusiasts around the world to bid on a one-of-a-kind YZF-R1 as ridden by “King” Kenny Roberts around the famed Mazda Raceway Laguna Seca circuit. This special GYTR-equipped R1 features a unique 50th anniversary Red/White paint scheme and many Genuine Yamaha custom performance accessories. 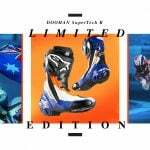 The bike will be sold at no reserve to the highest bidder as part of Mecum’s Motorcycle Auction segment during Pebble Beach weekend, scheduled for Thursday evening, August 18 in Monterey, California. 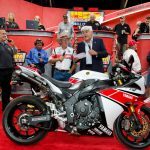 Serving as designated “auctioneers” for this R1 will be none other than Jay Leno, who will also be joined on stage by “King” Kenny himself. 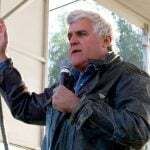 “The proceeds for this Yamaha R1 will go directly to Bailey’s Café, a fantastic school of the arts for kids in the Bronx,” said Jay Leno. “Once the bidding is over, I’m sure that the performance of this R1 will only be matched by that of the kids in this great school!